We were trying to spend as little as possible for last week's Finance Fridays about Black Friday. This week we are talking about another event that happened last week – The Autumn Statement. Let's have a look at what the new Chancellor of the Exchequer, Philip Hammond, has in store for all of us. After the annual Budget statement each March the Autumn Statement is the second most important financial statement. It has decisions in it which affect both businesses and individuals. Salary Sacrifice – This has become popular among employees in recent years. In return for giving up part of their salary an employee can receive in return things such as computers, gym membership and private health care. One of the benefits of having a lower overall salary is that you pay less income tax and national insurance (as does your employer). This is obviously something that the government wants to get their hands on. This is will come into effect from April 2017. Some salary sacrifice will be exempt such as pension contributions, child care vouchers and the cycle to work scheme. National Savings and Investment Bond – With interest rates at a record low savers are struggling to find accounts with a decent interest rate. In order to benefit of the interest rate which be around 2.2% you will need to agree to deposit your money for three years. The minimum amount you can put in is £100 and the maximum is £3,000. The bond will be launched next spring. Fuel duty frozen – For the seventh successive year it has been postponed. The chancellor said it should save the 'average car driver' around £130 a year. Rise in Insurance Premium Tax – A third rise in 18 months means that Insurance Premium Tax will go from 10% to 12%. This will affect all car, home, travel, pet and private medical insurance policies. Letting fee ban – Letting fees are already banned in Scotland but this will now be extended to take in the rest of the UK. Estate agencies can charge tenants who rent one of the properties on their books for services such as an initial letting fee, tenancy renewal and change of occupancy. Time will tell if the estate agents and property management companies will instead pass on the shortfall to the landlords to pay instead, who may well pass it onto the tenants anyway. National Living Wage – From April 2017 the National Living Wage for employees aged 25 and over will rise from £7.20 to £7.50. Good news for employees but could be tough for small businesses to absorb. Income tax – The Income Tax threshold for 2017/18 will rise from £11,000 to £11,500. Therefore anyone earning under £11,500 will not pay any income tax. The last thing to be abolished is the Autumn Statement itself. The Budget in March 2018 will be the last held in the spring with the Budget statement taking the place of the Autumn Statement. 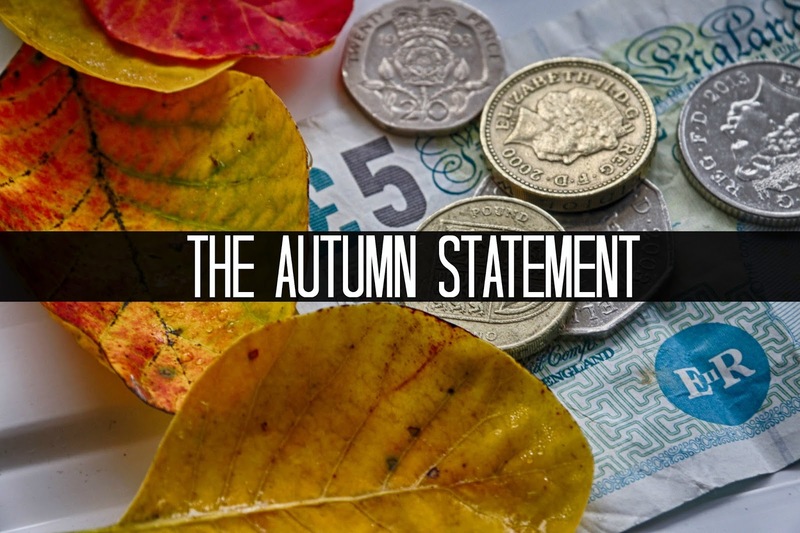 How will you been affected by the Autumn Statement? Is it good or bad news for you? If you want to join in with this week's Finance Fridays then add your link to the linky below. Any post concerning financial matters is allowed. Full detail here. It doesn't have to be published today as you have until 23.55 on Tuesday 6th December 2016 to join in. A mixed statement, don't you think? It seems the chancellor thought so too, seeing as he's scrapped next year's! With regards to the fee on rentals, I live in Scotland and some private landlords and agents still add on such fees. I will now know to stay away from them if I decide to move. I actually thought it was pretty pants. They gave to the people that didnt need it and yet again took more from the poor. yers fuel duty has been frozen, but what people do not remember if that car tax is back from April at a set amount rather than based on car emmisions, so our £0 tax (which we factored in to the car when we bought it) will now cost an additional £140 a year! I hadn't heard about the car tax changes, Jen. That's awful. It won't make any changes to us as we're paying about £150 a year but having to now budget in an extra £140 a year isn't right.